Up for a challenge? How about a 51-mile bike ride through Eastern Kansas? Or maybe you can turn that into a trek on foot. This rail-to-trail park follows an historic rail corridor from Ottawa to Iola, passing through Princeton, Richmond, Garnett, Welda, Colony, and Carlyle along the way. Completed in 2008, the trail offers the perfect opportunity to explore Kansas from all sides. My wife, Amy, and I tried various parts of the trail recently, starting in Ottawa. The trail is paved within the city limits of Ottawa, Iola, and Garnett, and perfect for a family walk among playground, exercise trails, and picturesque residential neighborhoods. Once in the country, we found the trail covered in crushed limestone, still perfect for biking or hiking in any weather. Much of the trail is lined by trees and shrubs, offering protection from prairie winds. There is still plenty to see along the way, with views of farmland, rivers, and prairie. 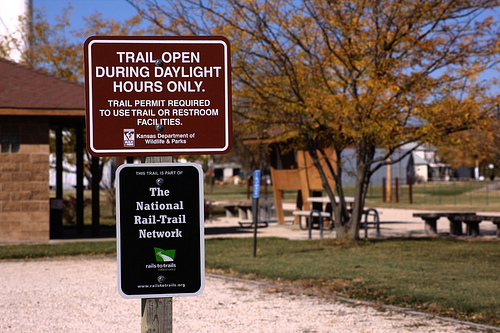 Each of the towns along the way offer restrooms, picnic spots, and information kiosks, as well as a self-pay station for the minimal $3.50 charge to use the trail per day. So no worries about having to wait 51 miles until the next pit stop; there are plenty of opportunities for a break and a relaxing pause along the way. Between stops, there are plenty of surprises to motivate trekers to keep going on to the next discovery. A bridge over a quiet stream, or a prairie vista offered us chances to stop and enjoy Kansas scenery from a unique perspective. The trail began as a rail line created and operated by the Leavenworth, Lawrence, and Galveston Railroad (LL&G) in the late 1850&apos;s -- Garnett is celebrating its sesquicentennial this year, giving you an idea of when the whole corridor began. The line was purchased by the famed Atchison, Topeka, and Santa Fe Railroad, which ran trains through the area from the 1880s until the 1970s. Now, with rails removed and trails in place, the corridor is managed by the Kansas Department of Wildlife, Parks & Tourism, with volunteer support from the Friends of the Prairie Spirit Trail. Garnett proved to be one of our favorite stages of the trek for Amy and me. Passing through the county fairgrounds and recreational park and then strolling near the historic downtown and courthouse square was a perfect prelude to a stop at the renovated Santa Fe train depot. We&apos;ve got plans to return and take in more scenery and history, getting some exercise along the way. We hope we see you on the trail. Dennis Toll is a native of Kansas — his Swedish ancestors settled in Wallace County in the 1890&apos;s — and graduated from Kansas State University in 1980 with a degree in landscape architecture. Then Dennis and his wife Amy, a Manhattan native, went to Indiana where Dennis got a master’s degree in theology and then to France. They returned to Kansas with four daughters in 2000 and settled in The Little Apple. Dennis enjoys writing for various publications about the Sunflower State and wishes he had more time to spend hiking the prairie.